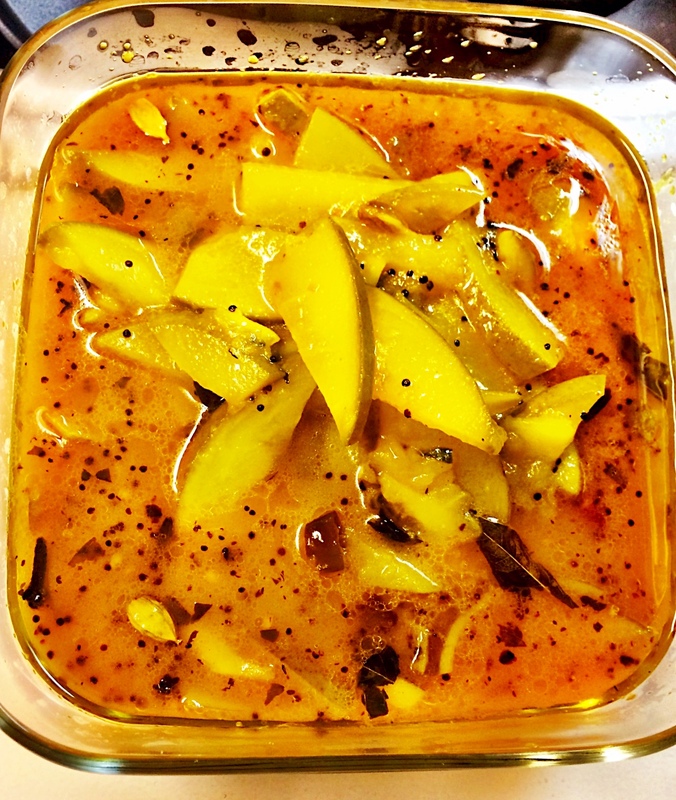 Khatti Meethi Amiya (Sweet and Sour Mango Pickle) – One Half Indian. I wanted to try making an easy Indian pickle mostly because everyone kept telling me not to make any pickles due to how difficult they can be. The child in me refuses to be told no, so I of course made it my mission to try pickling. This was my very first recipe, and it is super easy. I actually added way to much water to mine and it still tasted delicious. The pickle ends up being almost more of a chutney in my opinion and very versatile. I actually only ever ate this with an Indian dish once. The rest of the time my husband and I enjoyed dunking cheese quesadillas into the sweet and spicy sauce. Some quick notes about this recipe: 1) The way this recipe appeared in Saveur magazine, it was meant to feed an army. I have cut the size down so that you don’t have mango pickle for weeks (like we did). 2) Don’t be afraid of green mangoes like I was! They are good and pretty easy to find at your local Indian store or even Asian market. Heat oil in a large saucepan over medium-high heat. Toast mustard seeds, cardamom, cloves, curry leaves, chiles, and cinnamon until seeds pop (about 1 minute). Add turmeric, chile powder, and mangoes. Cook until mangoes are tender (about 8-10 minutes). Add sugar, salt, and water. Simmer ingredients together until sugar is dissolved (about 2-3 minutes). Remove the mixture from the pan and let cool. Serve it up with some warm Indian bread like paratha or naan. Or just eat it will a cheese quesadilla like me. The American way to enjoy your Aamba Khatta.